It is always encouraging when we see or hear about families doing things or activities together as a family. In our activity of drum corps, having family members involved whether currently or in days past, helps greatly in keeping the drum corps activity alive and well. This month we travel to the Deep South, home of warm weather, Southern style cooking, Southern hospitality, and home to Atlanta CV. This is where we meet the father and son duo of Ted and Stan Phillips. 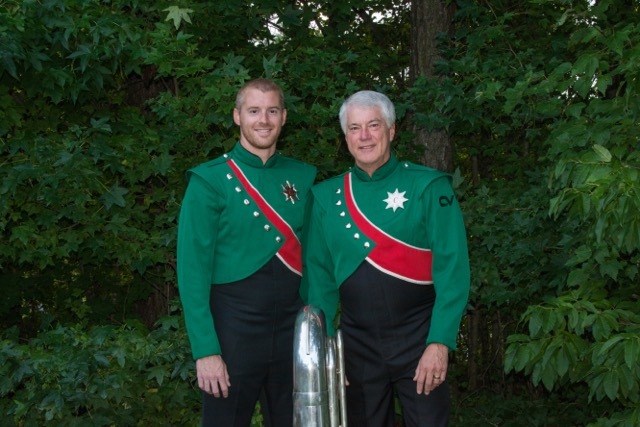 Ted Phillips became involved in drum corps in the winter of 2012 where he attended several camps with Alliance. Unfortunately, that year Alliance went inactive. In and did not compete in 2014, one of Ted’s former students and drum major, Mikhail Lovell, mentioned that he was trying out for Atlanta CV, so Ted figured he would give it another go. Low and behold, he was given a contract and went from holding on for dear life, to performing like it was meant to be! Ted chose DCA because it was the closest organization that represented the type of shows and performance that he always wanted perform. Having worked with marching bands for over thirty years, he was comfortable jumping into the DCA venue. Ted feels that drum corps on the DCA level has changed to the point that if we were doing every days like the DCI units, we would pretty much be online with them. So instead, we just jam it into a weekend’s worth of activities and “holy smack” this DCA activity is pretty intense! LOL. Being a retired band director, Ted has taught at many schools in South Georgia, for over 30 years starting in 1979 in the Mount Vernon/Vidalia area, then Ocilla, Richmond Hill, Leesburg, and finally Moultrie. Interesting enough, Moultrie is his hometown where he got his start in music, played in the band, graduated, then returned “full circle” to teach music and retire. Ted stated that the main benefits drum corps has given his family, “Is a new family of friends, a new respect for the activity, and the opportunity to march with someone you are very close to namely my son Stan. Knowing that he has performed with DCI’s giants Carolina Crown and the Blue Devils in his time, and now to share this experience with him is the ultimate of “too cool”. Why at age sixty does Ted still do this activity and what does he get out of it? Well as he put it, “Once upon a time, I was the chief of this very activity and while I loved it, I was always the chief! With Atlanta CV, I now get to be the Indian and perform to my heart’s delight, tweaking whatever they need to be better and loving life the whole way through! I gain euphoric pride and satisfaction through responsibility, dedication, and teamwork”. All of this he thanks Atlanta CV for. When not doing drum corps, Ted likes brewing craft beer, playing golf, and traveling with his wife Jennifer. Soon he will extend his hobbies into the evenings with a new telescope and astro photography. Jennifer mentioned that Ted is having a really special year with Atlanta CV. Marching with Stan, having his sixtieth birthday on a show night in the Atlanta Dome, and also having another one of his band kids from the 1990’s marching with them. Stan Phillips got interested in drum corps when his dad Ted, showed a video of Star of Indiana from 1990. He marched with Carolina Crown in 2001 and the Blue Devils in 2005, playing tuba with each corps. Stan chose DCA because he thought it was awesome watching his father march with Atlanta CV back in 2014. He told his father that if he ever did it again, he would do it with him. Following in his father’s footsteps, Stan is currently in his third year teaching as the assistant band director at North Paulding High School in Dallas, Georgia. Since Stan has done both DCI and DCA, I asked him what he thought was the biggest difference between the two organizations. He stated, “Competitive aspects aside, the biggest difference between the two is the time commitment.” Not to say one is more than the other, but it is drastically different from being able to put everything aside for three months to focus on marching as opposed to keeping the focus and determination every weekend spanning five to six months. Since his marching days with DCI, Stan feels that it has changed into elaborate stage productions and every single corps has become ridiculously talented with incredible design packages. I asked Stan how has drum corps benefited his family and how does it feel to march alongside his father? He stated “Marching with my dad is two things. On one hand, it is such an awesome experience because very few people get to experience what it’s like to do something so meticulous, rewarding, and fulfilling that you both eat, sleep, and breathe together. My only hope is that I never take that for granted. My dad is an inspiration and let me stress this; he is sixty years old and he’s not keeping up, rather he is setting the bar. There is NEVER a time when he is down in spirit, checked out of rehearsal, not doing the right thing, or not fully committing himself to be the absolute best member out there on the field”. But wait there is more to Atlanta CV than just the Phillips family in 2016! Corps Director, David Stollberg, has four other families involved with the corps this season. Twin sisters Brianna and Micheala Wilkerson are both first year members of the mellophone section. Sisters Leigha and Nicole Woodard are members of the front percussion ensemble and bass drum line respectively. Snare drummer Ryan Armstrong is the son of show coordinator Alan Armstrong. Nichole Beck is a two year vet playing marimba and also a vet of their indoor percussion line. Both her parents, Lisa and Dexter, are super volunteers and equipment folks for Atlanta CV, as well as Davis Henry, baritone soloist and David Henry Brass Caption Head and program coordinator. The administration is also full of families, David and Tammi Stollberg, and Abbi and Rob Scott. There are hundreds of stories about families in drum corps today and in the past. The families of Atlanta CV are just one of them but are a prime example of why the family unit is an important part of drum corps. Thanks to Corps Director David Stollberg and Jennifer Phillips for their valuable input and photograph with this article.